"With the passing of Halloween, millions of pounds of pumpkins have turned from seasonal decorations to trash destined for landfills, adding to more than 254 million tons of municipal solid waste (MSW) produced in the United States every year," a post to the Energy Department’s website this week read. "At landfills, MSW decomposes and eventually turns into methane–a harmful greenhouse gas that plays a part in climate change, with more than 20 times the warming effect of carbon dioxide (CO2)," the government agency warned. As a result, the Energy Department is investing in projects to develop "biorefineries" that would convert plants–like pumpkins–and waste into biofuel and other products that would have a "positive environmental and energy impact." "When MSW is used to harness bioenergy–rather than simply being thrown away–the end result benefits the environment and helps our nation become less dependent on carbon-based fuel," the webpage read. "Harnessing the potential of bioenergy allows the United States to generate its own supply of clean energy that reduces greenhouse gas emissions. It also limits stress on landfills by reducing waste and could ultimately create jobs for manufacturing, installing, and maintaining energy systems." 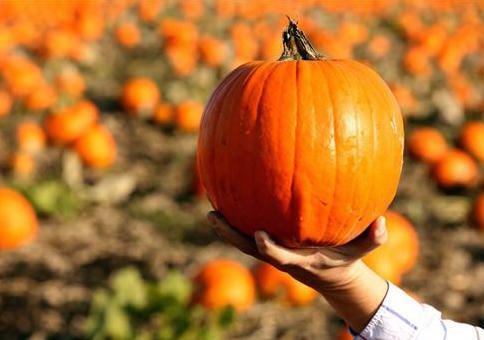 The United States produces 1.3 billion pounds of pumpkins each year, according to the federal agency.